President Recep Tayyip Erdoğan will be sworn in next week, starting his term as Turkey's first president with executive powers, while the new cabinet will also be announced the same day. Details regarding the switch to the presidential system, which was adopted in a referendum on April 16, 2017, emerged Wednesday. Accordingly, Erdoğan will attend the oath-taking ceremony in Parliament on Monday at 4:00 p.m. local time. Erdoğan will then attend a ceremony on the switch to the presidential system at the Beştepe Presidential Palace Complex in Ankara. The new presidential cabinet will also be revealed Monday afternoon. Meanwhile, the first decree transferring some executive powers to President Erdoğan was issued Wednesday in line with Turkey's move to a presidential system from a parliamentary one brought about by last month's presidential and parliamentary elections. The decree, issued in the country's Official Gazette, brought about changes in some 5,000 laws dating from 1924 to 2017 changing references to the prime minister and cabinet of ministers to the president and the president's office. The Turkish electorate approved switching from the parliamentary cabinet system to an executive presidency – proposed by the ruling Justice and Development Party (AK Party) and backed by the Nationalist Movement Party (MHP) – in a narrowly-decided referendum on April 16, 2017, with 51.4 percent of the votes. Though the new system was scheduled to kick in after the elections in November 2019, the early elections led to the swift shift to the new system. In the June 24 elections, the AK Party formed the People's Alliance with the MHP. As a result of the elections, the AK Party had 42.5 percent of the votes, losing the majority in Parliament. The MHP received 11.1 percent of the vote, pushing the People's Alliance to 53.6 percent. While the People's Alliance received 344 parliamentary seats, of which 295 are AK Party deputies, the Nation Alliance, which was formed by the Republican People's Party (CHP), the Good Party (IP) and the Felicity Party (SP), received 189 seats in Parliament. The Peoples' Democratic Party (HDP) also took 67 seats in the parliament with 11.7 percent of the votes. 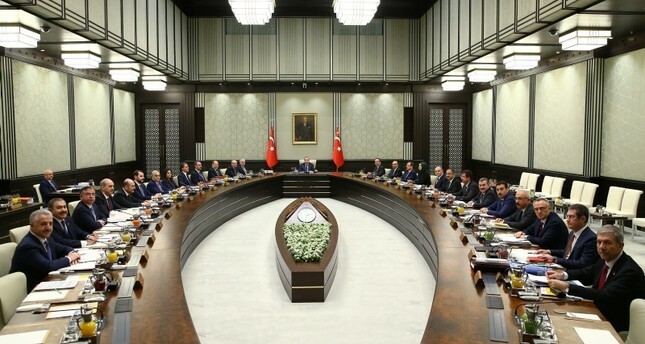 When President Erdoğan is sworn in, a decree law establishing 16 ministries will be published. He will also announce the new cabinet following the establishment of the ministries. In a sign of a more streamlined governance, the number of ministers who will be appointed by the president will decrease from 21 to 16. The ministries will not be removed; rather they will be combined, with the Foreign Ministry and European Union Ministry united under a single portfolio. The same is true for the Customs and Trade Ministry and Economy Ministry, the Ministry of Labor and Social Security, the Ministry of Family and Social Policies, the Ministry of Food, Agriculture and Livestock, the Ministry of Forestry and Water Affairs, the Ministry of Development and the Ministry of Science, Industry, and Technology.